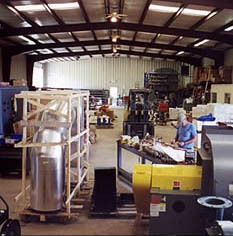 As well as being an industry leader in the manufacture of new heat processing equipment, HED® International, Inc. also provides fabrication facilities for in-house repairs and renovations to equipment previously in service. Our engineering staff will evaluate any system requiring repairs, renovations or modifications and provide you with a complete breakdown of all recommended work to be completed. This service is very helpful for existing as well as new customers.